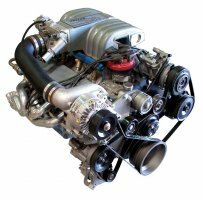 Paxton 1986-1993 5.0 Mustang System NOVI 1220SL Satin [1001831SL] : Supercharger Superstore, Your Online Source for Vortech Superchargers, Paxton Superchargers, Procharger Superchargers, Magnacharger Superchargers and Techco Superchargers! The 5.0 liter Mustang is arguably the most popular performance car in history, and even though the last Fox chassis rolled off the assembly line some 14 years ago, its still the car of choice for those enthusiasts seeking maximum bang for the buck. For the beginner, Paxton Automotive offers the NOVI 1220 supercharging system. This system also allows you to upgrade the compressor at a later time to a NOVI 1200 or 1500 for higher output. For applications that require more than 6 psig, we offer a discharge upgrade which will include a bypass valve and aluminum discharge tube.